We love our kids and we'd do anything for them (as you'll see shortly) but they've gotten a little spoiled by having interior designers as mothers. Now that they're all either in college or living on their own, the free design services have reached new heights. Though, to be fair, the precedent was set at a young age in both of our households. Iris' daughter is in college and whenever she moves into her accommodations for the year, she expects her new room to be perfectly designed (on a budget, of course). It's like one of her basic needs: food, water, air and a gorgeous space. While when she's feeling lazy she'll say, "You decide. You're the professional designer," most of the time it's extremely evident that she's picked up a few things from mom because she has a very clear and specific vision for her room. A prime example of this occurred a week ago. Iris and her daughter disagreed about where to place a chair. Iris told her it didn't fit where she wanted it but she wouldn't budge and insisted on her layout idea. A few hours later, Iris returned and the chair had been moved because, OMG, she realized mom was right! This same design session culminated with Iris purchasing art supplies as her daughter's vision for the room included a piece of artwork with cacti and a pink background. They couldn't find anything like it anywhere, so Iris ended up painting it herself. Talk about custom! Though, Iris' daughter did tell her that the artwork was even better than anything she could have purchased because not only was it exactly what she wanted but it was also made by her mom – awww. Christine hasn't been spared the blurring of work life and home life either. Both of her boys and her daughter-in-law always want their spaces to be designed as well. When her youngest was little and ready for a more "grown-up" bedroom, Christine went all out. She splurged on the area rug her son loved and they picked out the perfect paint colors together. Since the apple doesn't fall far from the tree, her son went with something a little more out of the box and requested one color for the walls and another color – a pretty celery green – for the moldings. Christine's husband told him no that he wasn't painting the moldings and her son started to cry and informed them that his room was now ruined. Though the debacle has since been forgotten, as her son soaked up the last few days of summer before kicking off his freshman year of college, he went on one shopping trip with Christine. 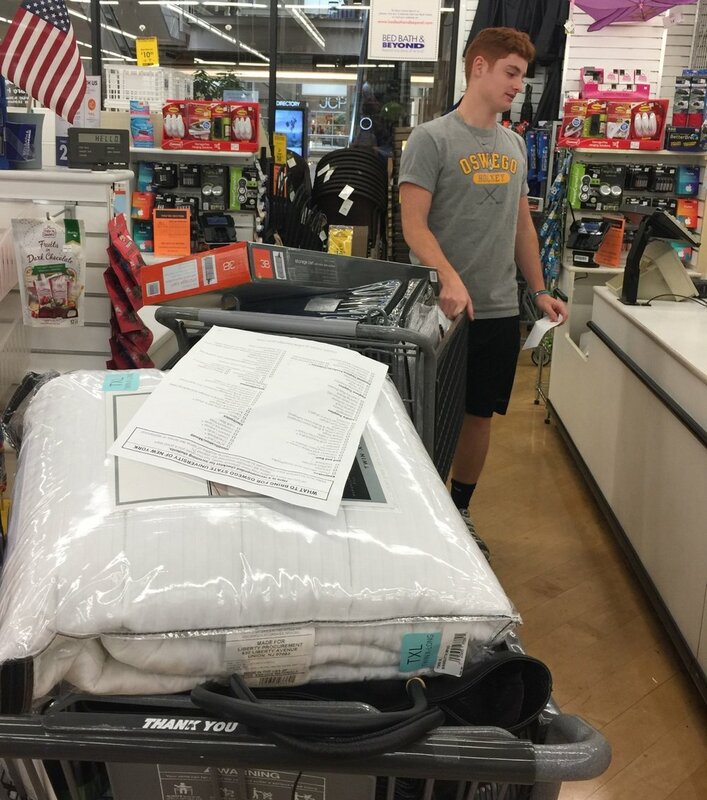 Then, she finished up shopping for his extremely stylish dorm room on his behalf (tough life the kid has...not really). Christine's son and the packed car en route to college. Clearly, he has everything he could possibly need along with anything his dorm mates might need! To be honest, we're actually thrilled we've had some influence on our children's style and we're passionate about what we do, so offering a helping hand when it comes to their spaces is a pleasure – most of the time. To their benefit, our kids are well aware that they're pretty lucky and they know not everyone is privy to free design and personal shopping services. With that being said, if you don't happen to have an interior designer in the family and you want a customized, beautiful space, contact us. We might even be willing to break out the art supplies.